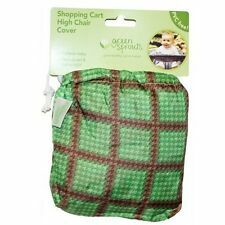 ❤ Made from ultra soft padding with 100% polyester fabric, this seat cover won’t irritate your child’s delicate skin. ❤ It’s machine washable, so you can always be sure that your baby will have a clean and comfortable sea t.
Due to the different display and different light, the picture may not reflect the actual color of the item. We will try our best to reduce the risk of the custom duties. Detail Image. Made of peach velvet printed cloth, filled with hollow cotton. Material: peach velvet printed cloth, filled with hollow cotton. It can give the baby more protection. Due to the light and screen difference, the item's color may be slightly different from the pictures. It can give the baby more protection. Due to the light and screen difference, the item's color may be slightly different from the pictures. Size: 120 70 cm(approx)(stretching amount). Anyway we will try our best to avoid this kind of thing. We will try our best to reduce the risk of the custom duties. -Due to the different display and different light, the picture may not reflect the actual color of the item. Detail Image. Bright Starts Tag And Go Baby Shopping Cart Cover. Condition is New. Shipped with USPS Priority Mail. Totally brand new. I (dad) just did most shopping on my way home from work so rarely brough the kid to supermarket. Never even took it out of its carrying case!!! Very colorful. Has a tucan bird stitched on and seems very good quality. it was $49.99 when we bought it. Hurry priced to sell. Durable, soft and comfortable, giving your baby maximum protection. We will do our best to make you satisfied! Features [SHOPPING CART COVER & HIGH CHAIR COVER FOR BABY]: Do not limit your creative mind to a shopping trolley in grocery or supermarket only, it works great as a High Chair covers in restaurant, and isolate your baby from germs and bacterias in any common situations. Well designed to perfectly fit onto almost all sizes of shopping carts in supermarket and scores of types of High Chairs in restaurants. The cleaning and storage of shopping trolley and children's high chairs in restaurants is a weak point that many people ignore, that's why such a thoughtful baby protective cover comes here and saves you out. [VERSATILE DESIGN-PHONE POCKET & STORAGE BAG] Two openings at the bottom for the baby to stretch t.
Durable, soft and comfortable, giving your baby maximum protection. - Material: Polyester. The product is new, never used and in good conditon, just go ahead and buy! The cushion is foldable, portable and convenient. Safety belt design, to prevent the baby fell off. Essential for mom and baby, soft seat cushion. Suitable for 6-48 months' baby, for boys and girls. Essential for mom and baby, soft seat cushion. The cushion is foldable, portable and convenient. Safety belt design, to prevent the baby fell off. Suitable for 6-48 months' baby, for boys and girls. Loop with buckle closure allows the pouch to hang from stroller or bag. Includes all item(s) seen in picture(s) ONLY. Actual item pictured. Easy to attach: one strap for baby, one strap for seat. Compact: folds neatly into built-in stretchy pouch. Like new no tears or stains! I ship fast! Durable, soft and comfortable, giving your baby maximum protection. The product is new, never used and in good conditon, just go ahead and buy! The cushion is foldable, portable and convenient. Essential for mom and baby, soft seat cushion. Safety belt design, to prevent the baby fell off. Suitable for 6-48 months' baby, for boys and girls.